Get free online food ordering & delivery system with software for your restaurant business. We deliver both the web & mobile for customer and delivery boy. Try Ontabee for free. Manage your restaurant business with Ontabee. Rev up sales with our feature-loaded online ordering system. 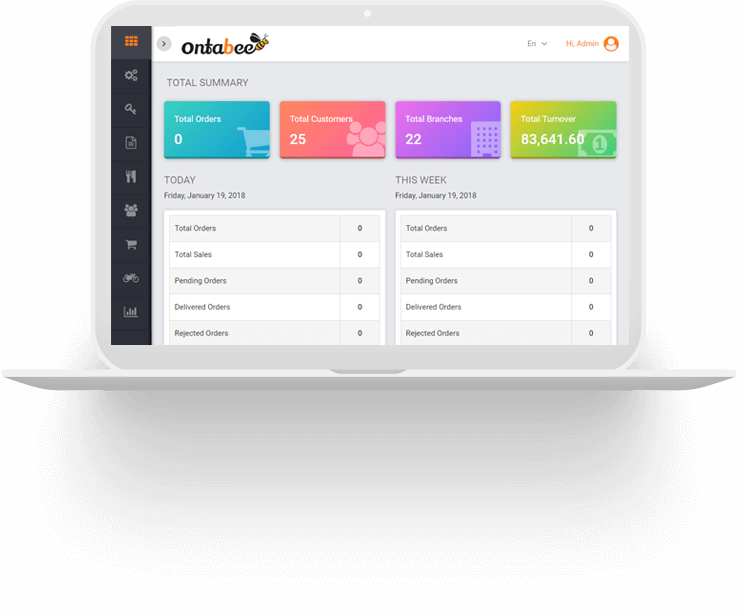 Ontabee provides back-end for admin to manage complete restaurant ordering system on the web platform. Admin can manage single/multiple outlets. Each outlet is provided with an order receiving app on both the web and Android platform. Your customers can order through the web as well as the mobile platform (Android & iPhone). Ontabee trial lets you run your restaurant business in real time. Be accessible to your customer with our website ordering system. You can seamlessly configure Ontabee to your website. Through our software, provide loyalty points to your customers on their orders anytime and make them your regular customers. Ontabee lets your customer use the mobile app, both Android and iPhone to place an order. Get your application in your own brand and generate more customers to your business. Nothing stops us to connect with you, even our language. Ontabee can function in multiple languages despite your geography. You can get your website and mobile app white labeled to promote your brand identity. Ontabee a Cloud-Based Ordering System for Small and Large Businesses With Multi-chain Shops. Ontabee provides you the required features that revolutionizes your business. Get your site ready within couple of hours and go live. Compatible for take away business. Enhance your sales growth with Ontabee, drive traffic and increase sales volume.